Boston hit five home runs Tuesday night, and the bullpen came through to beat Seattle. SEATTLE — Jackie Bradley Jr. was running on fumes Tuesday night by the time he finally got to Seattle after catching an early flight to rejoin the Boston Red Sox. Apparently his fatigue wasn’t a problem. Bradley hit a tie-breaking home run, Shane Victorino slugged the last of Boston’s five long balls and the Red Sox snapped a three-game skid with an 11-8 victory over the Seattle Mariners. “I’m tired. I’m going to crash out early tonight and try to get some rest, but it’s great,” Bradley said. Boston rallied from a 5-1 deficit, using two-run homers from Dustin Pedroia and Mike Napoli along with Bradley’s solo shot to come back. 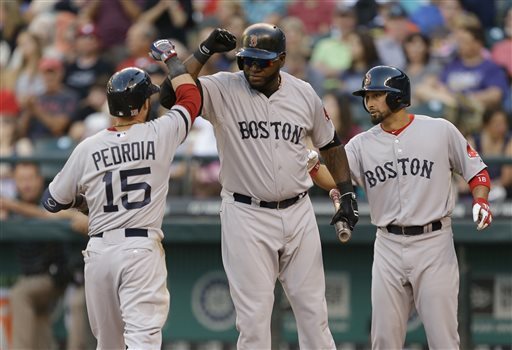 Pedroia and Napoli homered in the third inning and Bradley gave Boston the lead in the fifth. Victorino’s drive was part of a three-run eighth. David Ortiz had four hits, including a solo home run in the second off struggling Seattle starter Hisashi Iwakuma, to give him 1,688 hits as a designated hitter, tying Harold Baines for the career record. Ortiz doubled twice and singled in the eighth. “It means I’m getting old, man. You’ve got to play for a while to put numbers together,” Ortiz said. Boston avoided its first four-game skid of the season. Seattle was potent early, with Kendrys Morales hitting two homers, but couldn’t solve the bullpen. Alfredo Aceves, Craig Breslow and Andrew Bailey kept the Mariners scoreless for 42/3 innings after starter Allen Webster was tagged for seven earned runs in 21/3 innings.